Is utility maximized? Use the two rules of utility maximization - FreeEconHelp.com, Learning Economics... Solved! This article goes over the economics of utility maximization given an example of 2 goods. The post discusses whether or not utility is maximized and how total utility and budgets are impacted with choice changes. For a related economics problem on marginal utility and maximized consumption check here. Amy is shopping at a dollar store. She is currently buying 5 bracelets that cost $1 each and 4 sodas that cost $1 each. The table below indicates the marginal utility she obtains when she purchases this combination. a. Is this consumer maximizing his/her utility? b. If not, should she consume more bracelets or more sodas? Explain. 1. What happens to the Marginal Utility of bracelets and the Marginal Utility of soda? 2. What happens to the Total Utility received? 3. What happens to the total dollars spent? 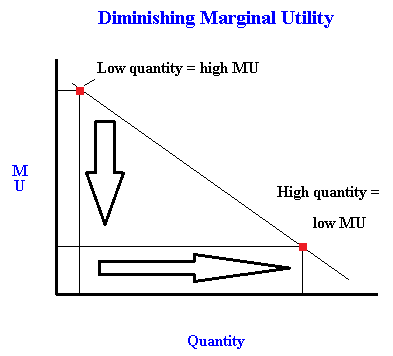 To answer (a) remember the two rules associated with utility maximization, first that the entire budget (or income) must be spent, and that the marginal utility per dollar spent (MU/$) for each good has to be the same. Since both goods cost $1, the marginal utility per dollar spent is simply going to be equal to the marginal utility. The problem does not give us any information about a budget or income, so we can check to see if the marginal utilities are equal. Since they are not, we know that this individual is not maximization their utility. Since the MU of bracelets is lower than the MU of soda, we should consume more soda and less bracelets. This will cause the MU of bracelets to rise, and the MU of sodas to fall. The question does not give us information about the MU at different quantity levels so we can’t say exactly how many sodas and bracelets should be consumed but we know that more sodas and less bracelets is the answer. To answer (c) we need to assume that one more bracelet is consumed and one less soda is consumed. (1) We know from the idea of diminishing marginal utility that consuming more bracelets will lower MU for bracelets, and consuming less soda will increase the MU of soda. (2) Since we are giving up 40 utility (from soda’s MU of 40) and receiving less than 30 utility (from the MU of the next bracelet) we know that total utility is going to decline. Even if the next bracelet gave us 30 utility, our net change would still be -10 (30-40). (3) Since the price of both goods is $1, and we are purchasing one less of one, and one more of one, the total amount spent has not changed (1-1=0). So there is no change in the total dollars spent.